I have 1 double room available for rent in our 3 bedroom house in a quiet area of wall Heath. The room includes single bed, table, chair and wardrobe. The house itself is fully furnished and has a Shared bathroom and kitchen. All bills including free wifi. We have a back garden, front drive and there is plenty of off street parking too. We are a middle aged couple with no pets who work away a lot but would welcome you into our home. No pets and no smoking home. 1 months rent in advance as it's 1 months minimum stay. House very close to the University of Birmingham and close to the selly oak and university stations (5 to 10 min walk) Price includes water, electricity, gas, internet Available from the 30th of March to the 30th of June 2019 The room includes a desk, chair, wardrobe and other facilities. If you're looking for beautifully presented, high spec rooms for professional tenants then take a moment on this one. We have a few furnished double room’s and also single rooms available All our rooms are freshly painted with wooden floors throughout, also the shared kitchen; living room and bathroom are newly refurbished. Bills Included: Internet Gas Electric Water Council Tax The property is close to a big super market ASDA, City road hospital, a petrol pump, a post office. Public transport is within walking distance and the bus to Birmingham takes 20mins to the City Center. If you are interested contact us now, first come first served. landlord will consider anyone who is working, final year and post graduate students, but will not consider anyone claiming housing benefit. Thank you. 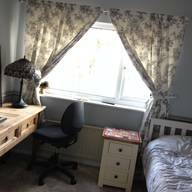 1 Room To Rent For A Working Male, Female Or Couple. The property is on Woodside Avenue and a couple of minutes drive to the historic town of Ironbridge, short walk to local amenities with good transport links to Madley that offers a verity of shops including a large super market, pharmacy, takeaways, restaurants and Library with good road links to Telford town center, bus and train station also M54. The room is over looking the rear garden and has a walk in wardrobe, bedside cabernet, table lamp, wall mirror with wooden flooring. Bathroom with electric shower and the house is centrally heated by a combi boiler. Use of all facilities and utencils. Comfortable sitting room that has 2 sofas, black coffee table and sliding doors that lead stright into the garden. You can also get to the parking bay through the back gate. Fully furnished and equipped ground floor apartment suite nestled within rolling Worcestershire countryside off the beaten track via a private farm lane but just 5 mins from local town of Droitwich Spa with all its amenities and 10 mins from Junction 5 Motorway access north and south. Furnished fitted and equipped to a very high standard with own entrance hallway full bathroom off with shower and bath electric towel rail and underfloor heating dependant on weather Open plan sitting dining room with fully fitted kitchen with fridge freezer washing machine hob oven microwave washing machine and all china utensils provided all kitchen linen, bedlinen towels and robes, Separate fully fitted double bedroom with wardrobes chests drawers.